Finding ways to deal with friction zones in public spaces such as parks is highly pertinent for both urban democracy and urban sustainability. Some friction is central to genuine democracy, whereas too little or too much is not. One theme that remained at the margins of the many exciting discussions at the Creating Publics, Creating Democracy event (see this week's theme) was how actual publics are assembled in and around public spaces. To this end, we will address what Parkinson recently described as the complementary blindspots of democracy theory and political science in general: at the same time that the physical spaces of politics are 'almost entirely off the radar’, in urban theory there is a tendency either to romanticize diversity in public space or to relegate democracy to a background assumption, or as a simple synonym for freedom. In our ongoing research on friction zones in urban public parks, we aim to outline the considerable potential friction zones have and what they can achieve for ‘emergent publics’. One Sunday afternoon on a raw March afternoon in Stockholm a man slept soundly in a double divan on the top of Toboggan Hill in Tanto park (see Figure 1). At first we saw only a man on a bed. But, after recognising the man – a man we have never spoken to but have observed on an almost daily basis over the past year – ‘in bed’ seemed a more adequate reading of the situation. For this was in a sense a man at home, in his place. He is a daily member of the group of street drinkers who had so thoroughly colonised this area of Tanto that the appearance of a double bed seemed almost appropriate. But the man in bed caused certain things to happen. Some passersby laughed. Others showed discomfort or disdain. Many showed blind disregard. In a few instances acts of civic responsibility were forthcoming. A jogger shook the man gently as if to assure himself that the sleeper was alive. Two elderly ladies stood for a while – seemingly on guard – beside the bed. What the ‘man in bed’ and the wider assemblage of beer empties, a public park and cold weather did was to productively, even jarringly, juxtapose the abnormal with the normal, the radically Other with the ‘norm’. It was an ‘in your face’ provocation; a wake-up call for at least some members of the ‘general public’ to reflect on issues of otherness, diversity, civic culture and urban sociality in the space of the commons. Figure 1. Man in/on bed at Toboggan Hill, Tanto, Stockholm March 2011. Photograph by Andrew Byerley. All rights reserved. 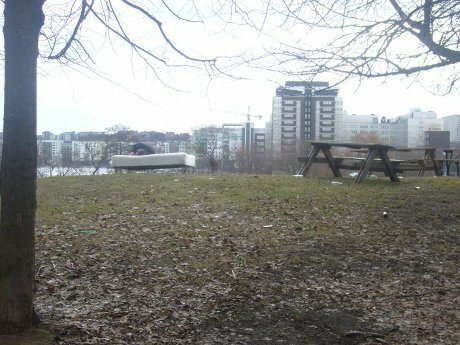 The man-bed assemblage on Toboggan Hill in Tanto here serves to illustrate a much larger constellation of interfaces – often constituting friction zones – between the publics and ‘counter-publics’ who use this and other areas of Tanto and other parks. Indeed, throughout the year various areas of Tanto have served as stages for multifarious dramas where the stage scenery is in a constant state of flux as assorted un-fixed infrastructure including benches, bins, tables, ash-trays, toboggans, chairs, police cars, ghetto blasters, ambulances and beds are dragged up and down and around the parks undulating topography by multiple publics and arms of the state – street-drinkers, companies of youths, Goths, joggers, punks, tobogganers, law enforcers, paramedics, groups of playschool and school children, ‘binge’ drinkers, dog-walkers. Over recent years these friction zones – almost always involving or reportedly involving alcohol as a key actant – have consolidated into a problemscape of ‘hot issues’ involving politics, planning, competing notions of the ‘Good City’ and ‘Good Citizen’ and diverse understandings of ‘the fate of public space’. From a theoretical point of view, this is a question of urban democracy and not merely the intervention of administrative measures to ameliorate disturbance. The clashes, contestations, attempted regulation and normalization of the uses of an urban public park is a democratic issue. These concerns are ‘hot’ in planning and urban studies where territorial controversies constitute a central area of study. In the literature the democratic aspect is a recurrent theme in analyses of the role and management of urban public spaces. Similarly, evidence of urban democratic vitality and, by extension, the good or just city have often been read off from the manner in which public spaces are planned, managed, and used. Such renditions – inspired by substantive readings of public space that stress the social benefits of co-presence – equate the scripting-out of possible encounters with remarkable others in public space with deficits to levels of civic engagement, civic culture and democratic politics in the city. This thesis has, however, been subjected to considerable critique. Sheller and Urry for example argue that it reifies the concept of public space by bracketing-out the role of other public fora such as electronic media. Others argue that asserting the need to reclaim ‘lost’ democratic public spaces employs idealized notions of past public spaces that were in fact also exclusionary in terms of gender, age-groups, ethnicity etc. From recent political philosophy we infer that if urban public spaces are to benefit co-presence and also to allow the possibility of contestation, then they should be enacted in a mode that allows divergence in a way that domesticates political antagonism. This, in order to allay the development of politics in a polarised friend/enemy mode (ultimately resolved by physical violence), while still not foreclosing the adversarial dimension by procedures aimed at rational consensus and mere ‘free dialogue’. In other words, it is argued that some friction is central to genuine democracy, whereas too little or too much is not. Otherwise there is the risk that consensus insensitive of difference may arise and in effect lead to a ‘postpolitical’ administration of public affairs where substantive democracy is in effect shortcut. Finding ways to deal with friction zones in public spaces such as parks is hence a highly pertinent issue for both urban democracy and urban sustainability. Public spaces are commonly conceived in theory as ‘meeting places’ with a distinct social function over and above other possible uses, yet juxtaposed and enabled by these. Hence, friction, whether perceived in positive or negative terms, is always part of this socio-political function of public space as otherwise no ‘meeting’ can be said to have occurred. Since public space is not always and everywhere contested, at least not in terms of becoming a public affair, we infer that public space in the political sense is not simply ‘out there’: it is brought into being through enactments around issues in different ways by different actors concurrently. Public space is enacted by administrative management and regulation, by physical design, and through the practices of a broad range of actors. Thus, the ‘fate of public space’ is not fully determined by its designation on a map and in a building code, since practices partially performing it take place elsewhere, on the screen, in homes, on the Internet, etc. Public space is hence not about a choice between ‘the square’ or ‘the screen’, but about observing many kinds of spaces and practices through which public space is enacted. However, the practice, or rather achievement, of democracy is nothing but contested terrain and friction. This is to rephrase the recently proposed shift away from proceduralism and towards a focus on how not to shortcut politics in controversies affecting the public. Here a different sense of the public becomes visible in what is a second way for parklife to be political: through a concern for the fate of this particular public space. In contrast to the yardstick conceptualisation of public space, which seems to depict the public as an already fully formed existing entity, contested parklife can illustrate why this notion might only lead to an impasse. Public space is not like a library or a bank filled with the democratic force of the public; always on call to fulfil its predestined role. As Marres, following Dewey closely, has shown, there is no public in democratic political procedure just hanging around in the hallways to readily engage in political contests. Rather, the question is what might or might not shape a public. And on the contrary, a public might materialize exactly when the political machine does not work. Publics form around issues - an issue has traction, so to speak - ‘when there is not enough good information available, and when the problems are too complex and puzzling for anyone to understand them fully’. Hence, a public might be ‘called into being’ when existing formal political institutions fail to settle an issue brought up by someone’s objection or complaint. Our proposition is that friction zones, such as those involving alcohol and claims on territory and behaviour, may help a public to gather and to articulate the issue in a formal political sense. Friction zones in Stockholm parklife, it can we think be argued, arise at the intersection of public administration, the post-industrial alcohol order, and competing discourses of acceptable–unacceptable behaviour in public space and how these discourses are, or should be, legitimized and operationalised. Here, for a public to form, it is necessary for public space to become a hot issue. In Stockholm parklife, certain behaviours are framed as bad, unacceptable, or pathological by institutions such as the police and the social services. It is a frame shared by some citizen representatives but not by all. Some citizens are denoted as constitutive of the problem, and as not taking part in this particular public articulation. Hence, the public space of parklife is a multiplicity. It comprises varying articulations of the problem that fail to fully map on to each other. Parklife, via the issue of friction zones, is certainly an entity of which there are ‘more than one, but less than many’; that is, as the ‘normality’ is contested there is not one essential Tanto Park but still highly divergent ideas on what could and should constitute normal parklife. The controversy is open-ended, fragmented, and any ‘realistic’ account of it, in the sense of one true state of affairs or framework, would be to take sides in this controversy. Framing the various problem definitions is what articulating these issues turns out to be about. Thrown together they give the rough outlines of an approach, through questions such as: who has an interest in normalising parklife? What frames do the actors involved produce? And what are the ramifications and sanctions? This article is part of the Creating Publics, Opening Democracies partnership, funded by the Open University. Read more about openDemocracy's editorial partnerships programme.